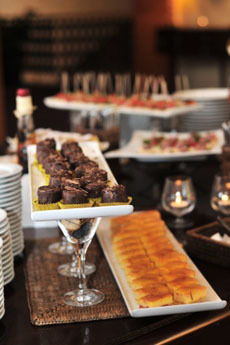 A dessert buffet is a great end to a big meal. Photo by Agnes Csondor | IST. Some people celebrate New Year’s Eve quietly at home, some go to parties. Others watch firecrackers or participate in midnight runs and other group activities. We ring in the New Year with a dinner party featuring everything new: new recipes, wines we’ve never tried, even some guests new to the group. Five hours and seven courses later, it’s time for dessert. As many of us have found at big Thanksgiving and Christmas dinners, getting up and walking around after the main meal ends helps to loosen up space for dessert. Get the moving started with a dessert buffet. Set the coffee and tea next to the desserts. Guests will not only have to move; they’ll have the opportunity to chat with people who haven’t been seated near to them. And, they can elect to cut small pieces for themselves. Those with no room left can participate with a spoonful. Your buffet can be as simple as a cake, a pie and a bowl of fruit. You can also call for a dessert potluck. A final tip: Be prepared to wrap up the leftover desserts and send them home with guests. That way, you’ll start the new year temptation-free.